I was contacted in Fall, 2016, with an amazing opportunity to be included in Printed in Blood‘s new The Thing Artbook project. The book celebrates the 35th anniversary of John Carpenter’s sci-fi/horror classic film The Thing and since November, over 350 artists from all over the world have contributed art for this amazing collection. There is now 400-pages with over 375 brand new pieces of artwork created specifically for the book. Also included in the book is an introduction by horror director/actor/producer Eli Roth and an afterword by the Master of Horror himself John Carpenter. 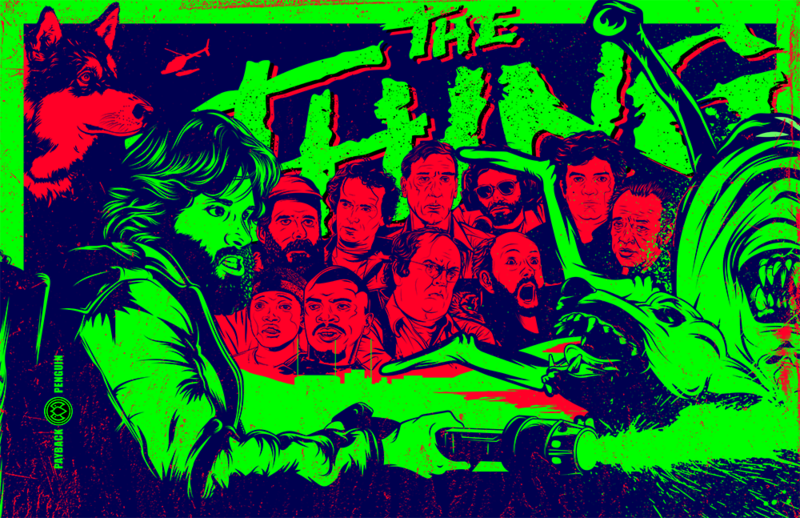 When I started creating my piece I knew I wanted to include all the main characters in the movie with Kurt Russell’s character R.J. MacReady as the focus. Since MacReady accuses every character of being the alien he positions himself as the martyring hero of the film. Due to submission time constraints I went for a two color design knowing there were so many characters to illustrate. Overall I was pleased with the strong graphic style this piece created and the nod to MacReady’s forced isolation and conflict.